A lot of people get interesting logs to improve the appearance of their yards. It's no different when your "yard" is a part of a lake. Our yard is defined by "working logs" called a boom. 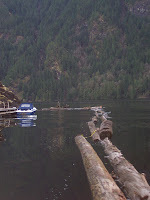 These are large skookum (strong) logs linked together to cut down on wave action during storms and from passing boats. Inside we like to have interesting logs to provide a little colour. This spring, two new logs came to adopt us. One was quite warn and covered with moss. I like the airy holes where the roots used to be. 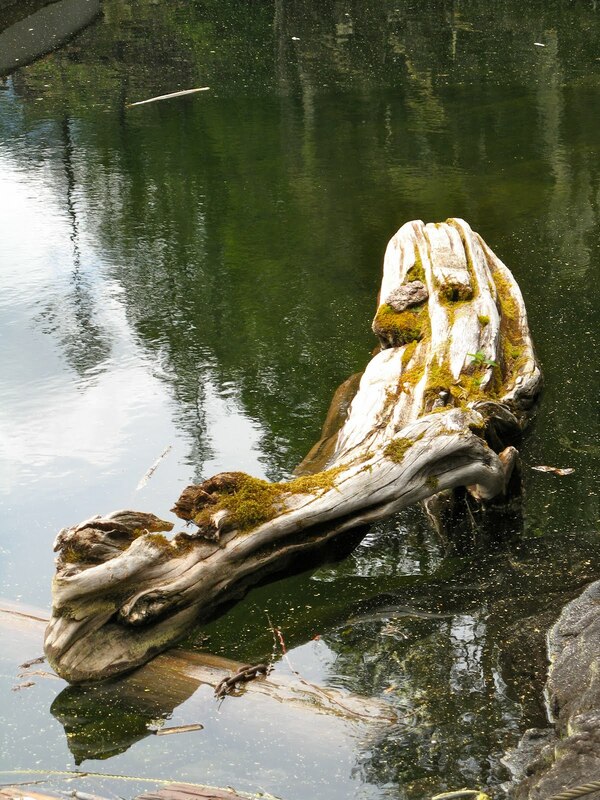 The other log was long and flat, with a great growing surface for future flowers. It already has a good moss covering and tall grass. Roots grow down through the wood for a constant water supply even in summer heat. This new log resembles my old "garden log" that disappeared last winter. The lake taketh, and giveth on it's own schedule. After planting a few seeds, logs like these can become great flower gardens. Here's a stump we got several years ago. I originally wrote this post several years ago. 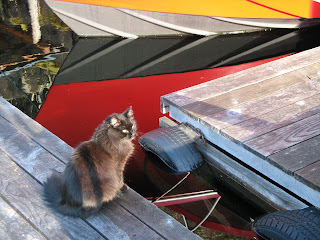 But with our impending car and ferry trip from Bellingham to Powell River, I thought it would be a good time to share again for all my cat lovers. I was really afraid when it was time to move my cat Stick Tail from Pomona to Bellingham. But the flight on Alaska Airlines, including a transfer in Seattle, went without a hitch (Flying with My Cat). Stick moved in with Mom and adjusted almost immediately to his new surroundings. Now they are inseparable (Stick on the Job). 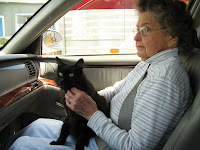 The next challenge was taking Mom and Stick north to Powell River by car and ferry (Driving with My Cat). I was afraid Stick would try to escape, so I started out using his carry case. He voiced his complaint quite vociferously. I shouldn't have worried, he's such a fraidy cat. The last leg was up the lake to our float cabin (Stick on a Float). The boat ride's his least favourite part, too noisy and bouncy. The up side is he has a blast exploring the cabin and float structure, and once he even got over to the sheer rock wall (Hole in the Wall Mountain Cat). Now, the trips to and from Bellingham are pretty commonplace. Stick doesn't have to ride in the carrier and there's no need to use a relaxer any more (he really hated the taste anyway). In the back seat of the car he has his blanket (crocheted by Mom, of course), litter box and water dish -- a home on wheels. But where does he choose to sit? On top of the carrier - go figure. Stick still gets car sick, but we are prepared. We carry towels and baggies to take care of the mess. Cats are like humans, they can get car sick too. After he has cleared his stomach, the rest of the trip is pretty enjoyable for Stick. Purchase a carrier that gives your cat plenty of room. At home, open the carrier for non-threatening exploration. At home, put some catnip in the carrier to make it attractive. Put your cat in the carrier for short periods of time. Take your cat on several short practice drives. Research airline and border crossing requirements. Carry your cat's original rabies immunization certificate. Get an additional Health Certificate for airline travel. Check with your vet or pet store about anxiety remedies. If you are traveling early, limit or skip your cat's breakfast. Use the carrier for initial car trips and all airline trips. 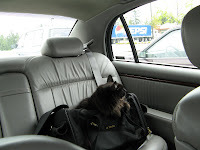 Allow your cat to get out of the car carrier after acclimated. Use a leash or harness if needed to hold or catch your cat. Have a passenger hold your cat for about 20 minutes. Have a towel handy for car sickness or shedding hair. For long trips, have water and litter available. After arrival, hold your cat for about 20 minutes. Close bedroom doors before releasing your cat. Take your cat's own dishes, toys and litter box, if possible. Remember, cats are more adaptable than you may expect. Logging is an important part of the history and present for Powell River. The forests were logged for trees to provide lumber to build the Townsite and to sell on the open market. Logging also provided the timber necessary to create pulp for the paper mill that founded the town. Today, pulp for the mill is imported on barges, but logging is still an important part of the economy in Coastal BC. Times are tough, but there is still work in the forests. While new technologies have changed the industry, some of the tried and true methods continue. One "piece of history" you will see in use today is the boom chain. Large logs are chained together to create corrals for the logs being floated to market. Here's a boom on Powell Lake ready to go to the south end and waiting trucks. Take a look at Paul's "A Powell River Photo Blog" for a great post about that part of the process. They say beauty is in the eye of the beholder. If you are looking for a strong link to keep your logs together, a boom chain is the epitome of beauty. Holes are drilled at each end of a boom log. The chain is threaded through the end of one log using the flat end. Then it is threaded through the hole of the adjacent boom log. The large ring prevents the chain from falling out of one log. The flattened end is placed perpendicular to the log on the other end, creating a strong connection that can withstand the extreme forces created by wind, wave and towing. Some people travel around the world to see gorgeous sunsets. I am lucky enough to see them right from my balcony. Tonight the sun slipped below the gathering clouds before dipping behind the mountains of Vancouver Island. It just doesn't get much better than this! Last year year I wanted to see if I could grow rhubarb in a pot on the deck. I started with a bare root and put it in a cut-off small blue barrel. You aren't supposed to harvest any stalks the first year, but I did snitch a few for a strawberry rhubarb pie. I wasn't sure if the roots would survive through the cold of winter with so little soil to insulate them, but I was pleased to see an even heartier plant this spring. The stalks are longer and thicker already and the season has just begun. Of course, this year we had a mild winter so maybe it won't be the same all the time. 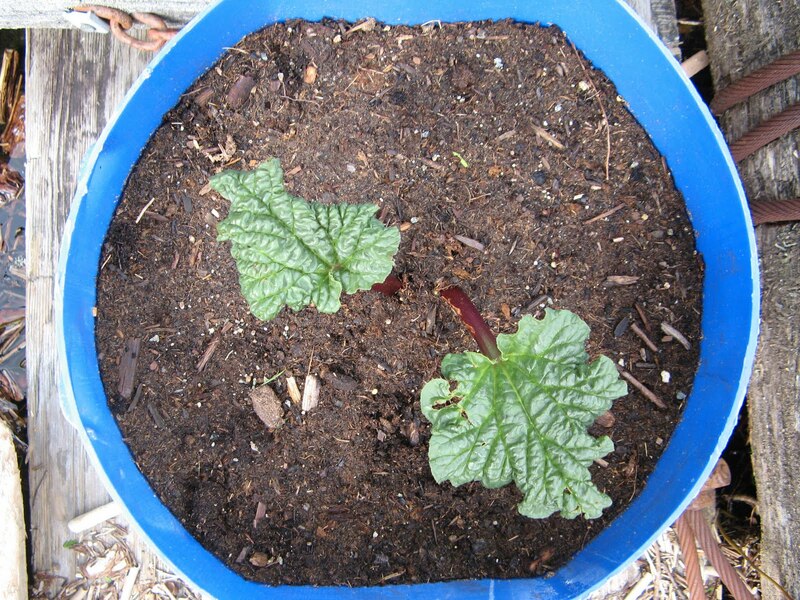 But I am chalking this up as one of my container gardening success stories. You've read quite a bit about our new boat. 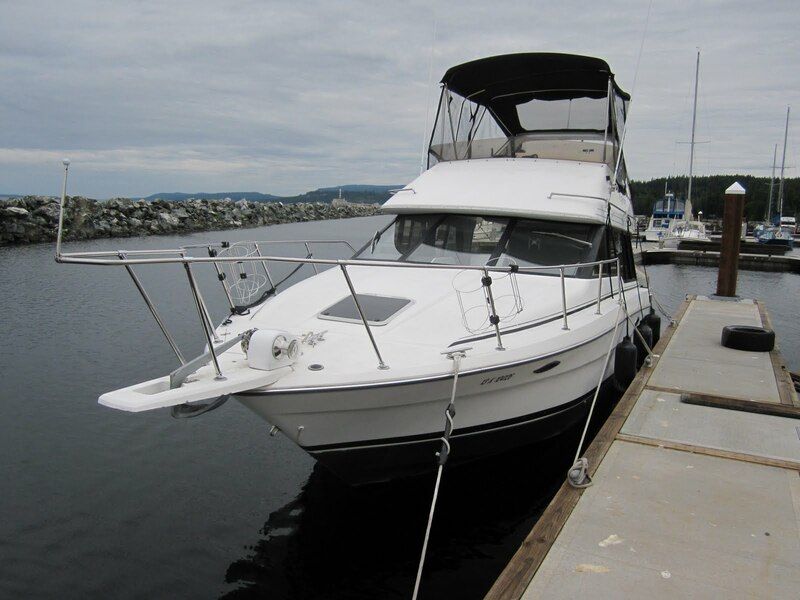 We did an extensive boat survey before purchase, but you never know what you'll find until the boat is yours. We went out into the Fraser River to try our remotely controlled windlass anchoring system. We started lowering the anchor slowly with a few stops. On the third start, the anchor started in free fall and the chain was ripping out of the locker at a fantastic speed. Then I saw something fly into the river. Finally, it stopped when the chain turned to rope and jammed. That was anchors "away" in a literal sense. The shaft sheered and the clutch (brake) was gone. We also learned we had over 100 feet of chain, most of which was lying at the bottom of the river. Fortunately, the windlass had an independent drum operated by a foot switch. Wayne wrapped the chain around the drum and began the difficult task of retrieving our anchor. I had to keep repositioning the boat because at the time, the Fraser was running at about 4 knots on an ebb tide. The good news was we got both our anchor and chain back. We carefully piled it on the deck and started looking for a repair shop. Having to everything by phone and Internet was a little daunting, but we found Saxon Parker of Explorer Yachting. Not only could he fix our windlass, but also replace our ailing fridge. He did it professionally, and most importantly, within our extremely short time frame. Sax sent his installer technician back to show us how the windlass operated. That was extremely helpful since the manual that came with our Lewmar left a lot to be desired. When we were at Secret Cove, Wayne called Jim, the wharfinger in Powell River. He said that even though the marina wasn't done, we could come in after 5:00 p.m. or before 7:00 a.m. We were early, so we stopped for fuel in the South Harbour and peaked inside our breakwater to see what was happening. The construction barge was blocking the entrance and busy working on the last two docks. We anchored off Willingdon Beach for a relaxing afternoon in the warm sunshine. Kids were fishing from the float at the end of the breakwater, catching lots of little fish. Life must be good now that school is out for summer. Heading to our slip, the first sign that things weren't quite done was a sign: MARINA CLOSED FOR CONSTRUCTION. Inside there were just a few boats. You hardly ever see a marina this empty. Soon it will be full, but not today. When we got to our slip, it was still barricaded by two old dock section. Since most spots were empty, we picked one nearby and left a message for Jim. It seems we found the only good weather day to move our boat from Richmond, BC, to our home port in Powell River. Wednesday, Friday and Saturday were all windy with choppy seas. Thursday, the seas were fairly calm with two to three foot swells coming from the northwest. There's nothing like a warm, sunny day to boat along the Sunshine Coast. We decided to take the direct route from the Fraser River to Gibsons. Rather than pounding in the swells, we slowed down and rode them in a teeter-totter motion. Our Bayliner 3058 really handles well with its wider beam and longer length. On such a nice day, we didn't see many other cruisers, but we did pass this classic commercial fishing boat. When we reached Sechelt, we slipped behind the Trail Islands where the swells diminished. After the Merry Island Lighthouse, we were in calm water. We chose Secret Cove for our fuel stop. We'd been there before in our 2350 Bayliner (now for sale) and felt it would be a good open fuel dock to approach. Two women fuel attendants met us upon arrival, so it was an easy event. Even so, Wayne brought the boat is with grace and ease. It seemed late in the day, but it was only 8:45 a.m. When I said we had just come up from Vancouver, she said we probably were glad to get away from there. At the time, we hadn't heard about the Stanley Cup Finals riots. We grabbed two cups of hot coffee at the marina store and went across the bay to try out our new windlass anchoring system. It has a remote control on the command bridge and a foot switch on the bow deck. We put the anchor down twice and then rested to drink our coffee and have a bite of breakfast. The rest of the way to Powell River was an easy ride. Long Texada Island blocked the northwest swells, allowing us to travel on plane all the way at a fuel saving 20 knots. The Powell River paper mill and the Queen of Burnaby ferry were welcome sights in the distance. On June 4, I shared a mama duck with her four little ducklings at the Skyline Marina in Richmond. They were taking a cozy little nap in the warm mud along the bank of the Fraser River. This week when we returned to get our boat, Mom only had two babies left, but they sure had grown. Thursday, Wayne and I took our new boat from the Skyline Marina in Richmond, where we've kept it for a month, to our new harbour in Powell River. We waited two days on board for a fair weather day for departure. Following a day of strong winds Wednesday, Wayne wanted to get started early. So we were up and going at 5:30 a.m. with the high tide. If you know me, I'm not an early bird. But I must say it was a beautiful time of day. Wayne navigated us out the north arm of the Fraser River past moored log booms waiting to head to the mills, and barges of sawdust ready to head back out, maybe even to the Powell River paper mill. My good blogging friend Margaret (Thistle Garden) from Powell River has taken a big leap. A little over a year ago she started a wonderful little restaurant called Magpie's Diner on Glacier Street in Westview. It instantly became a favourite breakfast and lunch spot for locals and visitors alike. The restaurant was cozy, but at times there just weren't enough seats for all the hungry customers. So on June 1, Margaret and her husband Art moved to a new location. She now can be found in the cafe in the historic Rodmay Heritage Hotel in the Townsite. Make a left off Marine onto Ash Avenue and follow Mapgie's signs to park behind the hotel. Enter through the lobby and you're ready for a sumptuous treat. The decor is a step back in time, with Margaret's fresh diner touches. I just love the old wood counter stools. Seating is also available in booths or dining room tables. No matter where you choose to sit, you will be treated to Margaret's warm welcome and wonderful food. Art is there to take care of your ordering and serving needs. This is truly a family business. Fortunately, now that she's expanded, Margaret has some additional help. In addition to her diner duties, Margaret is also available for catering. And I'm sure she'll be having some of her special dinner events after things settle down. Thanks for a great breakfast Margaret. We'll be back again soon! Update: Magpie's Diner moved to another historic place, this time in the Cranberry neighbourhood. They still offer the best breakfasts and lunches in town. Click here for an update. When I got to the cabin, the second thing I found was my downstairs bedroom filled with big cardboard boxes. There were so many I could hardly get inside the door. The garden tools I won from Sunset Magazine and a new BBQ were all encased in lots of heavy cardboard. Everything that comes up the lake must either be used or taken back down the lake. Cardboard is one thing we keep and use. Yesterday, I sat on the deck with my trusty ever-sharp kitchen knife and whittled the three big boxes down into kindling to start fires in our woodstove. When I got to the cabin Friday afternoon, I was surprised to see colourful newspapers taped over the windows. My first thought was that Wayne was starting to do some exterior painting. Wayne said no, it was because Barn Swallows were arriving from all quarters and looking for even the tiniest ledge for nest building. In May, we got everything set up for our returning pair of Barn Swallows. Maybe Bert and his lovely lady told all of their friends about how hospitable we are. Whatever the case, fluttering adds are encouraging the other birds to find a different nesting location. While nesting birds are fun to watch, it can get pretty messy underneath. Besides, the ledges the birds have to choose from are too narrow. We've had them try in the past and the poorly supported nests tend to fall, dumping their precious contents out way too soon. Once nest building time ends, we can take down our colourful flags. But in the meantime, we have Bert and his lady to watch. She's already sitting on the nest, so we'll have some little ones to enjoy by July. My floating garden has been getting lots of attention lately. As you know, it won a prize in the Sunset Magazine Facebook contest and a picture is now in their June issue. A blogging friend saw my announcement and asked if he could do an article about the garden. I thought for about three seconds and you know my answer was a resounding YES. 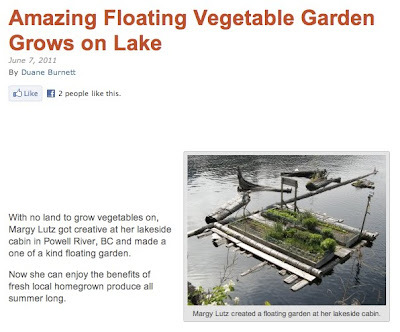 So here, direct from Duane Burnett's website is "Amazing Floating Vegetable Garden Grows on Lake." Low tide on the Fraser River made for a quiet time for a ducky of a nap. Mom and the kids warmed by the muddy banks drifted off to sleep.